Once upon a time, in a land far far away, a group of people gathered to listen to stories and tell tales about a magical thing called social pedagogy. Some had heard much about it, others very little, but they were all rather intrigued by the word and by its meaning. The word sounded a bit funny – pedagogy – and they weren’t quite sure how to pronounce it. And it seemed to mean so many things at once: some said that it meant sharing power with children, others talked about being more reflective about what they did, and others still suggested that social pedagogy was about venturing into learning zones. Could it be all of these things at the same time? As the evening unfolded and people greeted each other with five uncommon yet hilarious handshakes, it began to feel a little as if social pedagogy might indeed be quite interesting to explore. There were many people who had captivating stories to share about their experiences. They had all been pioneers – adventurers, one could say – and their journeys had been full of excitement, initial uncertainty, challenges that caused both frustration and a sense of accomplishment once they had been overcome. Their stories were laced with much passion and determination to transform themselves, their practice and the lives of the children and young people these people were working with. Feeling inspired, the listeners paid close attention and searched for examples that they could give. And thus, gradually, they felt connected to the adventurers and could see that, by being part of this gathering, they too were adventurers confident to explore new territory and to share their insights, so that when they would meet again there would be many more stories to tell about social pedagogy. And through these stories others would understand what social pedagogy really was and then live happily ever after. 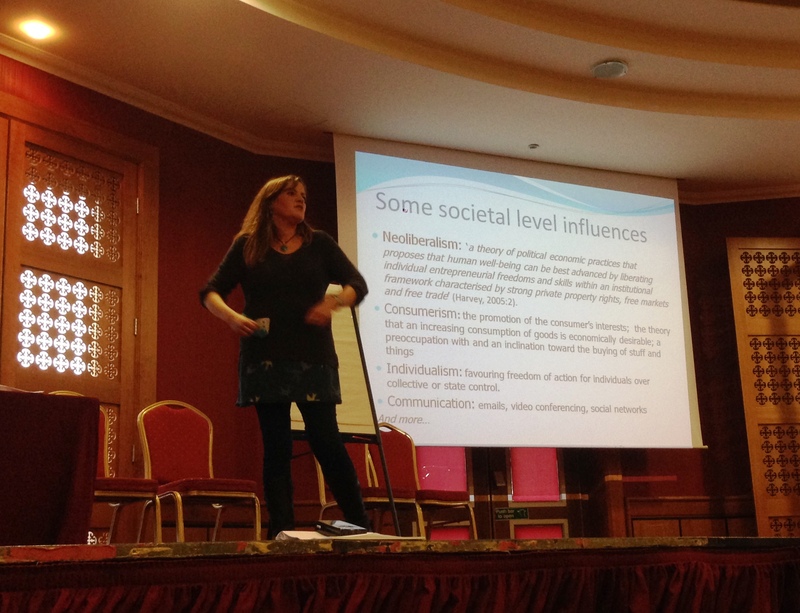 This is just one story about the Dublin meeting of the Social Pedagogy Development Network, and as it suggests there are many others. Indeed, storytelling featured quite centrally at both the evening and day seminars held at the Regency Hotel. 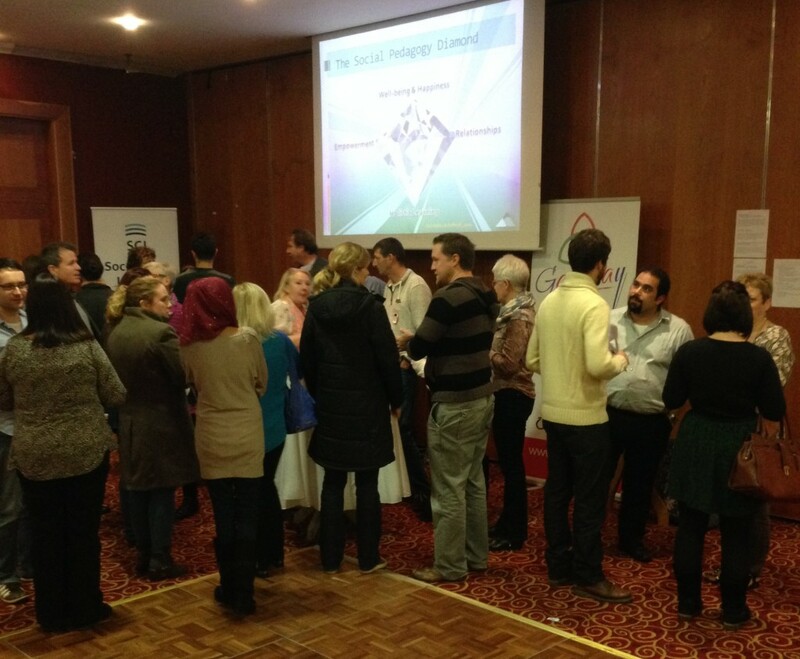 The event was hosted by Gateway, Empower Ireland and TransformAction International as part of a week-long series of events to bring together many different professionals involved in looked-after children and young people’s lives and to explore what unites us all irrespective of our professional backgrounds. We were pleased to welcome over 120 participants at the SPDN, who were keen to join us in exploring the role of reflection within social pedagogical practice. Following on from the excellent Unity through Relationship conference, the evening seminar was designed as an informal opportunity for participants to explore social pedagogy. We started off with a brief introduction into social pedagogy and an activity called the 5 handshakes, which brought people together and caused as much laughter as it created chaos. Much of the evening was dedicated to story circles, in which professionals from 13 different organisations shared stories about their experiences of developing social pedagogy. These narratives were a powerful way to convey what social pedagogy has meant to them and the children, young people or adults they’ve been working with. If you are interested in finding out more about the people involved, please click here to download our SPDN story booklet. The official evening programme concluded with yet another story, an Irish folk tale narrated by Nuala from the Causeys, who provided the excellent Gaelic entertainment at dinner afterwards. 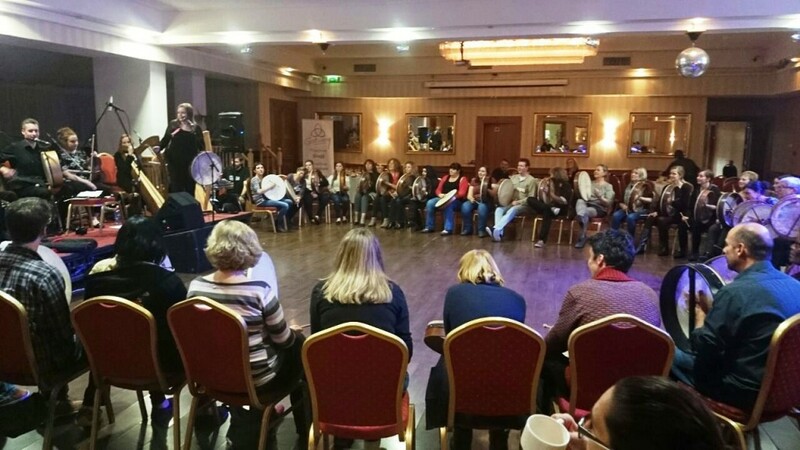 Many participants were eager to join in and play the bodhrán, sitting in a large semi-circle complemented by the band. Over a delicious meal of Irish stew, we also had a few outstanding performances by some very talented SPDN participants. And of course a Gaelic evening wouldn’t have been complete without cèilidh dancing. The amazing atmosphere built up throughout the evening gave participants a sense of ‘home-coming’, of having arrived amongst a group of like-minded people. This sense clearly carried over into the following day. In the morning there were clearly many stories to tell about the previous evening. After a brief outline of the day’s aims and activities, we had three storytellers sharing examples of their experience of the power of reflection. Martina Elter, social pedagogue at Capstone Foster Care, set the scene with two inspiring stories about lumberjacks and Head, Heart, Hands blog. Derek McDonnell from Tusla Child and Family Agency Midlands then share an example of a boy who had been taken into care and refused to give up his mobile phone and how, by pausing, reflecting and listening, he learned about the memories captured on the phone and their significance to the boy. Finally, Matthew McFadzean from Care Visions illustrated his personal experience of how reflection can enable us to keep a positive focus and outlook on life when we most need it. These three examples of the potential of reflection prompted conversations around the tables to share further experiences of what makes reflective processes so important and concluded in participants individually reflecting on what is important to them in such processes. After coffees and an introductory activity called digits in motion, it was time for Robyn Kemp from ThemPra to talk about critical reflection. In her very thought-provoking and personal presentation subtitled ‘choosing the path of most resistance’ she argued that this is a much deeper process of reflection that involves critical examination of practice context – of the societal-political factors influencing practice, the institutional influences, and our own individual influences. She concluded by outlining a social pedagogical approach to critical reflection, encouraging participants to seek to create ‘islands for critical reflection’ within the vast ocean of our learning zone. Thus we can encourage ourselves and others to leave our comfort zone, using critical reflection as a compass to navigate through the sea with confidence and a sense of purpose. Her presentation sparked a great discussion amongst SPDN participants and an interest in practical frameworks for critical reflection. The afternoon started off with a reflective group exercise called the girl and the sailor. The short story about a shipwrecked group of 5 people and their interrelations prompted lively discussions amongst participants about which character’s actions were most understandable and whose were least understandable. The reflection drew out how easy it is to make assumptions based on our emotional response to characters we might relate to, how different our value judgments can be, how difficult it is to reach consensus, and, most importantly, how easy it is to judge despite knowing that we don’t have the full picture or a detailed overview of a situation. The activity thus further highlighted Robyn’s points about why critical reflection is so fundamental in social pedagogical practice. One of the most fundamental principles underpinning the SPDN is the notion that every participant is an expert and has something important to offer to the network. Based on this notion, SPDN events are always full of contributions by members, and the Dublin event was no exception. Several participants had offered to run a 2-hour workshop on a theme related to reflection, and so we had a range of 9 fantastic workshops: Peter Frandsen and Christina Bornemann from Forumteatret in Denmark introduced participants to forum play as a creative method for reflection in which the audience controls the act and helps find new possibilities and solutions. Rute Goncalves from Surrey County Council offered a highly interactive space to try out a range of reflective techniques and simple strategies to use both professionally and privately. Elisabeth Grønning from Oslo and Akershus University College of Applied Sciences in Norway made masks with her workshop participants, which they then used to reflect on the ethics and aestethics of professional dialogue. Belinda Hopkins from Transforming Conflict gave an overview of restorative approaches as a values-based, needs-led way to engage with young people, introducing participants to various techniques for facilitating restorative reflection processes. Vasileios Tiliakos and Sylwia Cisowska from Staffordshire County Council picked up on the theme of storytelling and introduced participants to ways in which stories, directive imagination and interaction cards can be used to unlock new paths in team reflections. Lillian Byrne-Lancaster from IT Carlow shared her insights into helping students learn reflective practice and provided concrete tools to support students in these processes. Jörg Schlüter from < a href=”http://compasscfs.ie/”>Compass Child and Family Services and Toby Haslam-Hopwood from the Galtee Clinic reflected on their organisations’ journeys from social care to social pedagogy within an Irish context. Thure Johansen from the Social Pedagogy Consortium provided insights for new SPDN members curious to explore the relationship between social pedagogy and social education. And Derek McDonnell from Tusla Child and Family Agency Midlands introduced workshop participants to focusing as a powerful process to create a reflective pause in daily interactions with children and young people. Participant feedback from all workshops was hugely positive, and we’d like to take this opportunity to thank all workshop facilitators. To draw together the many reflections from the day in the final part of the SPDN, we asked participants to return to the question of what is important to them when they reflect. Using the Diamond Model, participants formed reflective clusters to share their thoughts on what is important with regards to well-being and happiness, relationships, holistic learning and empowerment. They also drew up concrete actions to make reflection an even more positive experience for everyone involved. Even at this late stage in the day, participants were buzzing with energy and ideas and seemed very eager to share them. It is this profound and passionate level of engagement with the learning and networking opportunities created at SPDN events that yet again made this the best event so far, and we are very thankful for having been joined by such an amazing group of participants. If you would like to join us at future SPDN events, please send an email to dialogue@thempra.org.uk. We look forward to hearing from you.